This work describes the development and application of class-selective molecularly imprinted polymers (MIPs) for the analysis of beta-lactamase-resistant penicillins, namely cloxacillin (CLOXA), oxacillin (OXA), and dicloxacillin (DICLOXA), in milk samples. Our method is based on molecularly imprinted solid-phase extraction (MISPE) coupled to high-performance liquid chromatography (HPLC) with diode-array detection (DAD). 2-Biphenylylpenicillin (2BPEN), a surrogate with a close resemblance to beta-lactamase-resistant penicillins in terms of size, shape, hydrophobicity, and functionality, was synthesized and used as the template for the polymer synthesis. 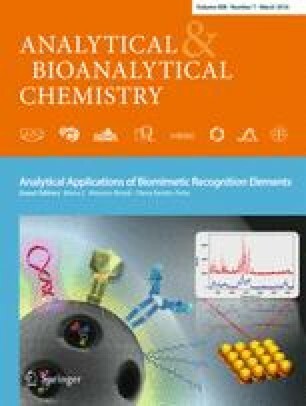 A MIP library was prepared and screened to select the optimum functional monomer, N-(2-aminoethyl)methacrylamide, and cross-linker, trimethylolpropane trimethacrylate, that provided the best recognition for the target antibiotics. For the MISPE application, the MIPs were prepared in the form of microspheres, using porous silica beads (40–75 μm) as sacrificial scaffolds. The developed MISPE method enables efficient extraction from aqueous samples and analysis of the antimicrobials, when followed by a selective washing with 2 mL acetonitrile–water (20:80 v/v) and elution with 1 mL 0.05 mol L−1 tetrabutylammonium in methanol. The analytical method was validated according to EU guideline 2002/657/EC. The limits of quantification (S/N = 10) were in the 5.3–6.3 μg kg−1 range, well below the maximum residue limits (MRLs) currently established. Inter-day mean recoveries were in the range 99–102 % with RSDs below 9 %, improving on the performance of previously reported MISPE methods for the analysis of CLOXA, OXA, or DICLOXA in milk samples. The online version of this article (doi: 10.1007/s00216-015-8941-6) contains supplementary material, which is available to authorized users. This work was supported by MICINN (INNPACTO IPT-060000-2010-14, MIPFOOD project) and MINECO (CTQ2012-37573-C02). The authors thank Priégola Cattle Farm (Madrid, Spain) for providing the milk samples. J.L. Urraca thanks the CEI-Moncloa for a post-doctoral contract.